Very few trainers give real weight to their pupils understanding and focusing on the collective marks. My view is that if you pay lip service to this as an ‘also ran’ you will not have a full understanding of the aims of your test. The collective marks allow the judge to give an overall score for their perception of how you and your horse performed THROUGHOUT THE TEST. It is their opinion as to how you as a combination conducted yourselves and the overall impression you left them with as the test progressed. This post is the first in a series that will explore how you can make the most of your collective marks. For those of you that know the scoring and how it works I apologise but I must start with scoring so that everyone understands what they are aiming for. In the event of a tie, the horse with the higher collective marks takes the higher placing. If the total of the collective marks is also equal the horses are given the same placing and grading points in accordance with that percentage. So, with this in mind it is really important that you know that throughout your test you are being marked not only for execution of the movement but also, the horses paces, submission, impulsion and your own riders position and seat. It is not something that will just happen. You need to work on these areas and really maximise your collective points. The collective marks in a test can mean the difference between winning and not winning. But for me that is not the aim of the game, for me the collective marks are about feedback on the very basics of your training and what you should concentrate on MOST OF ALL when you get your test sheet. Savour that 8 Vicki, it’s important too! So when there is really no impulsion because the horse is not swinging thru the back and engaged, how is it you can get a 5.5 or 6 for impulsion if there is absolutely none? To me, it should be a 2 or 3 if that. Couldn’t agree more Tina. No impulsion cannot be considered sufficient. 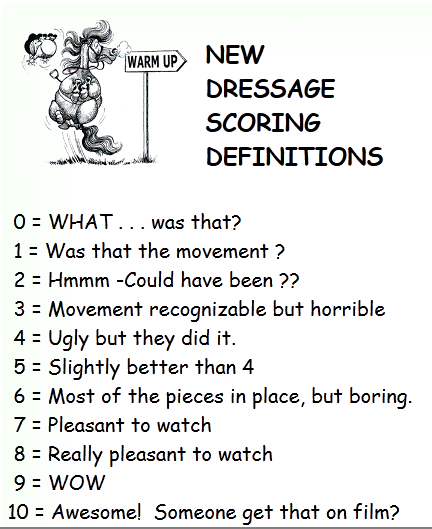 So why do you think the USDF judges score it so high when it really isn’t the true score?